Implemented in an "AdaptS12" form factor board, Adapt9S12XDP512 is compatible with an entire range of application cards, prototyping cards, and backplanes, and usable with solderless breadboards ("proto boards"). The module includes the Freescale S12XDP512 MCU and all necessary support circuitry, as well as a 5-Volt regulator, RS232, RS485, and two CAN transceivers on-board. The flexible, modular design of the "Adapt" series of microcontroller modules makes them suitable for training, evaluation, development, prototyping, and volume applications. An enhancement of the popular S12 family (and fully backward-compatible CPU), the S12X family utilizes the latest process technology. 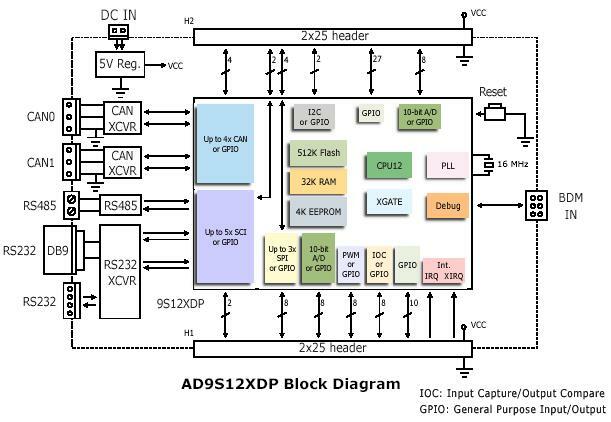 It boasts higher speed (40 MHz), more functionality, reduced power consumption and cost, and enhanced performance with the new XGATE RISC co-processor, on-chip memory-management, and DMA module. The MC9S12XDP512 combines a full suite of on-chip peripherals, including 512K bytes of Flash, 32K bytes of RAM, 4K bytes of EEPROM, six asynchronous serial communication interfaces (SCIs), three serial peripheral interfaces (SPIs), an 8-channel Input Capture/Output Compare enhanced capture timer, an 8-channel, 10-bit analog-to-digital converter, a 16-channel, 10-bit analog-to-digital converter, an 8-channel pulse-width modulator (PWM), five CAN 2.0A, B software compatible modules (MSCAN12), two Inter-IC Bus blocks, and a Periodic Interrupt Timer. The MC9S12XDP512 has full 16-bit data paths throughout. Note, however, that not all signals are brought out in the 112-pin version of the chip which is used on Adapt9S12X. The following list summarizes the differences between the S12XD family and the S12 family. This is an advanced product, for experienced users. You may wish to purchase a BDM pod such as our USBDMLT to assist you with product development. All of our standard connector options are available for this board. The product photo above shows "RA1" connector on both H1 and H2. Please make your choice of connector options before adding this item to your shopping cart. Otherwise, the board will be shipped without connectors on H1 and H2. 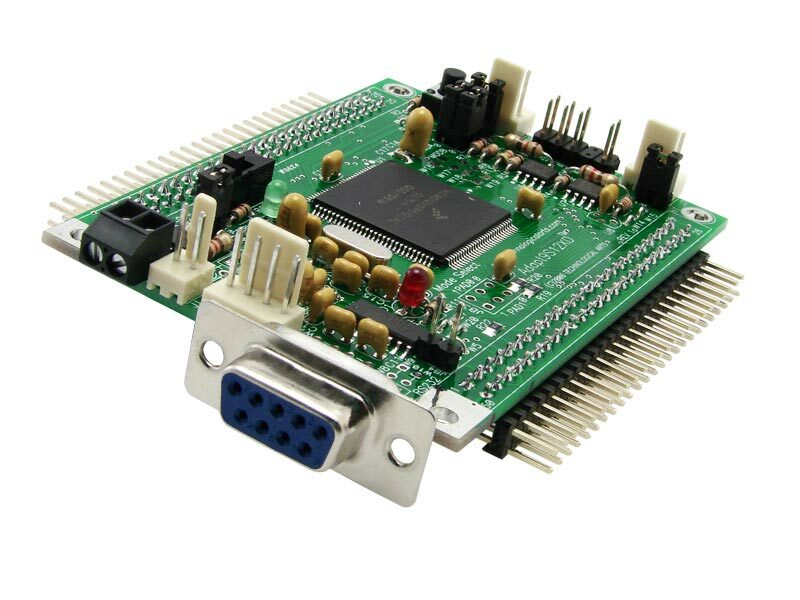 With a 2K Flash-resident debug/monitor program, you'll be able to load your program into the remaining 510K Flash via the serial port using our uBug12JE graphical user interface for Windows/Mac/Linux. The entire 510K Flash can be programmed in under 30 seconds! To use the monitor for debugging or code-loading, just set the switch to LOAD. To run your standalone program thereafter, leave the switch at RUN. Your code runs from Flash, and interrupts are supported (via Flash-based pseudo vectors, since the monitor resides in the vector space of the MCU). A program you load into Flash this way will run every time you apply power or reset the board in Flash Mode. If you want to take advantage of a more advanced development tool, the entire 512K Flash can be used, because the Flash-resident bootloader is no longer needed (therefore pseudo-vectors aren't required either). Make sure you get a BDM pod that supports XGATE (such as our USBDMLT or UBDM12XG5). If you plan to use CodeWarrior, USBDMLT is the recommended pod (called "TBDML" in CW).